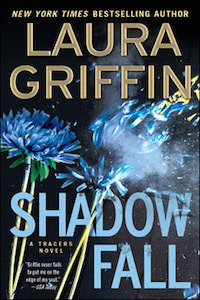 The ninth novel in the Tracers series that combines gripping plot twists with spine-tingling romance, Shadow Fall once again proves that “Laura Griffin gets better with each book” (The Romance Reviews). Tara looked out the window again and realized her pulse was still thrumming. He unnerved her. It wasn’t just his size, it was his attitude. Maybe she was self-conscious because he’d caught her off guard. She was definitely embarrassed that she’d pulled her weapon on him. She adjusted the vent and got a waft of hot air. His attitude bothered her, but she liked his truck. It smelled like leather and earth and felt deliciously warm. She forced herself to ignore the flutter of nerves generated by being alone in the dark with him. The nerves weren’t from fear but something else. And she wondered which was worse, being afraid of a man she was investigating or being attracted to him? She watched his face in the dimness, uneasy with the protective tone of his voice. “We confirmed the ID today,” she said. “Won’t be long till the media has it,” he added. Even if he was, he’d probably never admit it. But she at least needed to ask and get his reaction. Shadowing investigators could definitely be considered suspicious behavior. Although she had to be honest with herself. She didn’t consider him a real suspect. Despite his links to the victim, she simply didn’t feel it. “I’m guessing you filmed us approaching your property and ran my plate,” she said. She looked at him in the darkness, so confident it bordered on arrogance. And the crazy thing was she believed him. 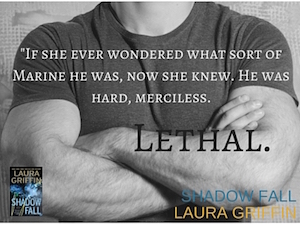 She bought into it completely—he was that good. His eyes locked on hers, and the air between them felt charged with electricity. His gaze dropped to her mouth, and her heart skittered. Was he going to kiss her? He eased closer, watching her, making her heart pound. Thank you for hosting SHADOW FALL! 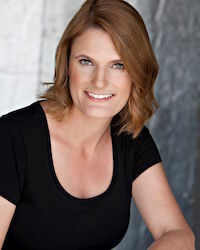 Thanks so much to Laura for stopping by to share her new release with my readers! It’s going to be a great addition to my TBR pile! If you have read any of Laura Tracers books. You will enjoy this one, it is a page turner.